Strange coincidences aplenty this week, one of them being that I needed an extra “something that smells of violets” for a post and along came – well – something that smells of violets. I have this odd habit, when it comes to compiling blog posts, that I can’t just ever think about a singular product; I have to find similar things, alternative versions, products that are (sometimes quite tenuously!) linked by virtue of scent, ingredients, effects or even the colour of the packaging. I think that this habit is an annoying hangover from my university days when I was continually encouraged to compare and contrast! Compare and contrast! So yes, I was looking for an extra “thing” that was violet-scented for a post – a post that will likely never see the light of day, because I’m quite useless like that, lots of thinking and not much doing* – and what popped through the letterbox? 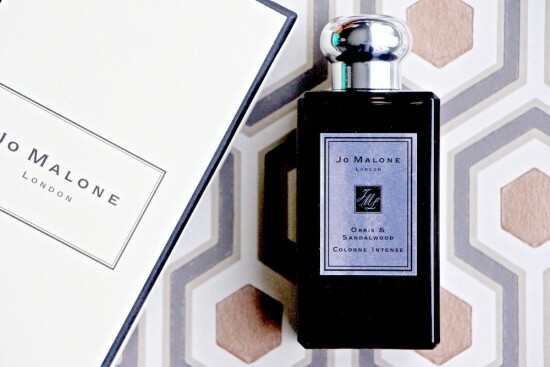 The new Orris & Sandalwood Cologne Intense from Jo Malone. A beast of a scent, if I may call it that, considering its floral nature. A beast because it’s a Cologne Intense and so has a bit more bravado and staying-power than the flimsier Colognes, which last all of about ten minutes on me. Give me the Intense any day of the week. Orris & Sandalwood, then. A floral, but not as we know it. Sweet, sugary violets to start with (Parma Violets, yes please) and then the Orris, which I had never heard of before but is the root of the Iris plant. The “tasting notes” describe the Orris as having a “unique duality”: both “woody and powdery, floral and deep”. That just about sums up this fragrance nicely, for me; along with the Sandalwood, which I always find to be a beautifully soft and gentle kind of wood, reminiscent of long summer evenings somewhere hot, the Orris is just superbly sultry and come-hither. Warm and enveloping without being overpowering or “talcum-powdery” and then these gorgeous flashes of sweet violet spiking through when you least expect them to. If you like your florals non-girly and warm then this, scent-hunters, is for you. The notes recommend to layer with Mimosa & Cardamom (didn’t like that one) and Dark Amber & Ginger Lily (I’m struggling with that at the moment after spending a year burning candles of the same scent – wearing the fragrance makes me feel odd) but I say it’s just perfect worn alone. It has enough heft to cut it as a winter perfume, but I imagine it will be equally as irresistible once the summer kicks in. You can find the new Orris & Sandalwood Cologne Intense at Selfridges here – it’s £105 for 100ml. *by the way, just in case the aforementioned post never materialises and you’re a Violet-Lover, the other products were the Guerlain Meteorites Oxygen Care Moisturiser (20% off here with code ESCENTUAL20), the Alex Simone Violet & Blackberry Candle (here) and the Patisserie de Bain Sugared Violet Hand Cream, £3.99 here. **the paper in the background of the photograph is Cole & Son Hicks Hexagon in Gold/Taupe, find it here.